2OG – A creative space for independent art and culture in Berlin-Mitte. Brought to life by the ‘Spreewerkstätten’-community to sustain cultural freedom for artists in a post-gentrified environment, 2OG is an entire floor of the ancient ‘Alte Münze’-building located in Berlin-Mitte, where permanent and temporary studios as well as public exhibition spaces for artists and creative-minded people have emerged. 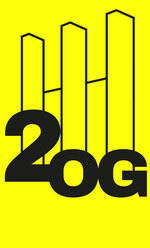 2OG is supposed to enable free art and culture productions by creating a unique work space and exhibiting opportunities which are independent from commercial ways of use. 2OG sees itself as an interdisciplinary hub for cultural experiments in the center of Berlin, a melting pot of social and cultural movements.